Now that we're passed the stage of 'all day sickness' (lucky you if you just had it in the morning!) I found out I need to be more conscious about food portions. My body naturally did that for me in the beginning of this pregnancy but now, I'm pretty much on my own. Half of the battle is remember to eat. Once my pantry is filled with healthy options I have to make sure my portions are not distorted. This morning I had generic Raisin Bran with skim milk and a little over half a banana. This means I ate 115 calories with the cereal. I always eat more when I'm tempted to fill the bowl without measuring. 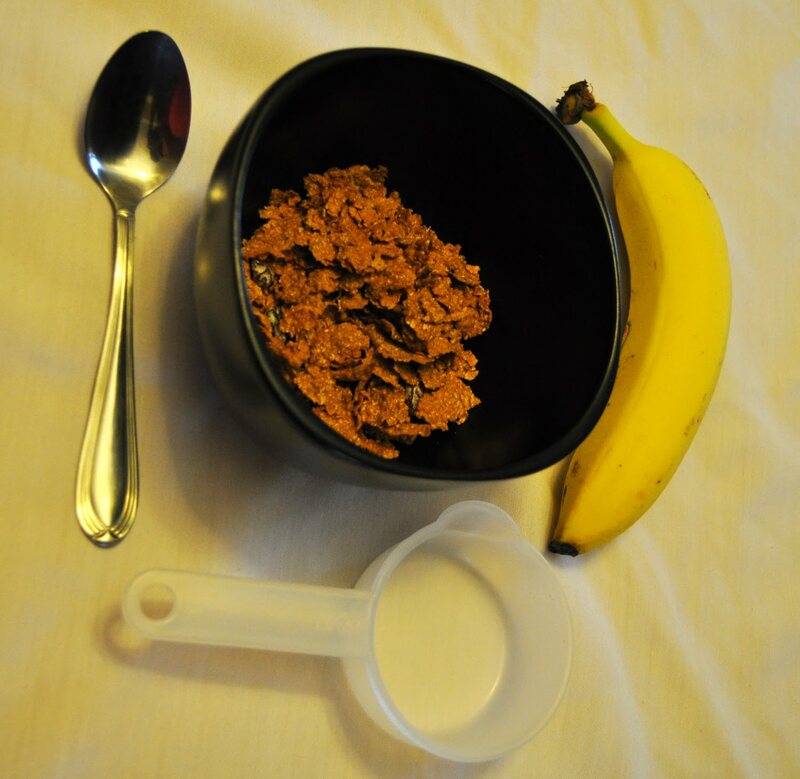 I often have to use a measuring cup just to prove to myself I can be satisfied with 1/2 cup of cereal. Another good thing is that my son is highly enjoying bananas. He eats a couple of small bites of one in the morning and I use the rest for my cereal. When it's time for lunch and specially dinner, the bigger the plate, the better it looks. I'm always tempted to fill it to the max, so I try to eat with my salad plate. I usually don't measure what goes in such a small plate but I used to and it was great. 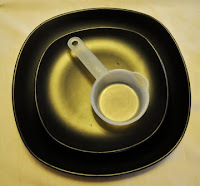 My dream is to make sure I buy a smaller set of dinner ware in the future. 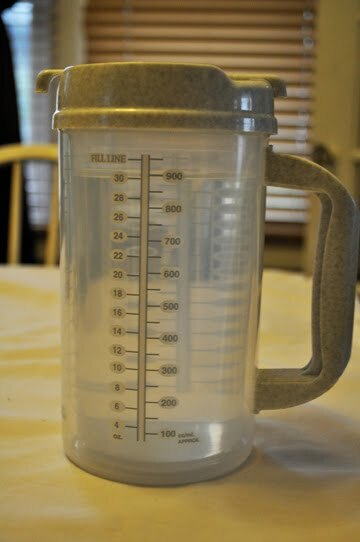 I remember that growing up I got used to drinking from huge cups while one of my sisters always used smaller sets and better controlled her weight. Here are my dinner plates and a 1/2 cup measuring cup so you can see the difference. The challenge to drink enough water is never ending around here. My son is in the game as well. He used to think that the water in the sippy cup was a toy but now he drinks a little bit throughout the day. It's a habit that needs to be acquired. When I was working full-time I used to place a huge water jug in my desk and the goal was to make sure it was empty by the end of the day. I did really well during my first pregnancy as well because of that habit. Weekends weren't always so good but I was always hydrated. Now that I'm at home more the battle continues. Some days I drink enough, some I don't. I use this big boy in order to measure what I'm drinking (or not). Different women have different philosophies when it comes to eating while pregnant. I swore to perfection with my first one: I started a skinny vegetarian and ended up a health conscious flexatarian. With my second pregnancy I had no choice. I still love to eat but in the beginning was just not hungry or couldn't eat much (let's not forget about the stomach bug incident). Now that things are somewhat back to normal I try not to be perfect (no food pyramids for pregnancy in my refrigerator) because I don't have the time. I try to make the best choices I can for myself, starting with portion sizes. My husband has encouraged me to keep walking as well as to get more vegetables, legumes and fruits in our diet. This week we've been eating better than I can remember in months. You'll find tofu, brown rice and lots of veggies in our diet, thank God and thanks to the leadership of my husband. My son never has to worry about eating great things. He eats lots of veggies, fruits and whole grains daily, it's up to the adults to end their portion distortion mentality. Sounds like you are on track to having a perfectly fantastic and healthy baby girl. thanks for the encouragement Rebekah!